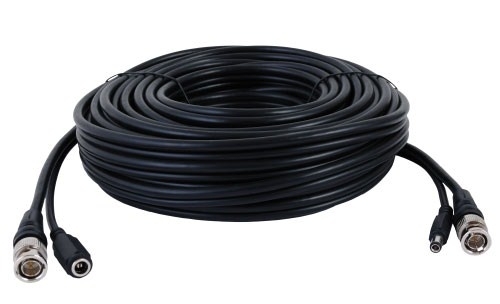 100 Feet of Video and Power Siamese Cable for use with both analog CCTV and HDCVI security cameras, add-on microphones, wireless receivers, and any other CCTV equipment that has a BNC video connection and 12V DC 2.1mm jack. Regarding the 100ft Security Camera Siamese Cable HD 1080P, Black (SKU: W100B), is it RG59U Siamese Cable (Copper Clad Aluminum)? It is a pre-made siamese cable and such cables are not RG59U. If you are looking for RG59U wire, then consider buying a roll of cable from this page. Can i use this with an HDCVI ptz camera?